SIBO is an acronym for small intestinal bacterial overgrowth. The name is luckily pretty self-explanatory. SIBO occurs when there is too much bacteria in the small intestines. Unlike the large intestine, the small intestine is supposed to have very low levels of bacteria. You don’t want too much bacteria in the small intestine it will inhibit the small intestines ability digest and absorb our nutrients. When too much bacteria starts to overgrow in the small intestine, the function of the small intestine is hindered by the inflammation driven by the bacteria. This bacterial takeover can lead to nutrient deficiencies, IBS symptoms, fatigue, hormone imbalance and systemic inflammation. First, the bacteria produce toxic byproducts that damage the brush border of the small intestines. The brush border is the absorptive surface of the intestinal cells and when it is healthy it produces enzymes that breakdown food. With the brush border out of commission due to SIBO, low enzyme release leads to carbohydrate malabsorption. Not only do we not get fueled by the carbs, but the poorly digested carbs provide fuel for the overgrowth. Over time this leads to a vicious cycle of intestinal inflammation, poor digestion/absorption and continual bacterial proliferation. With SIBO, you aren’t what you eat, you are what you absorb. Second, the bacteria also deactivate bile salts, which leads to fat malabsorption. If fats are not being absorbed well, fat soluble nutrients like vitamin D and A will also not be absorbed. This side effect can be seen in your stools. Greasy looking poops can indicate that you are not absorbing fats well. Third, the bacteria don’t just impair digestion/absorption, but they can also steal your vitamins and minerals. B Vitamins and Iron are nutrients that bacteria use to grow and proliferate. Deficiencies in these nutrients are quite common in SIBO sufferers. Fourth, due to the inflammation caused by the SIBO, the intestinal barrier starts to become more permeable. As food stuff and bacteria start to leak into the blood stream, our immune system kicks off an inflammatory response to help combat what it believes is a foreign invasion (but really it could just be particles from that pancake you ate at breakfast or some Bifidobacterium that slipped through the cracks in your gut). This immune response will cause local and systemic inflammation. The systemic inflammation can lead to hormonal imbalances, brain degeneration, poor energy and mood disturbances (and so much more)! Clearly, SIBO can wreak havoc on not only your gut, but your whole body! How does the bacteria overgrow or translocate into the small intestines? To heal from SIBO, you need to understand how bacteria can overgrow there. The small intestines has mechanisms to prevent bacteria from overgrowing. Breakdowns in these mechanisms will lead to SIBO. Therefore, SIBO is a SECONDARY condition!! 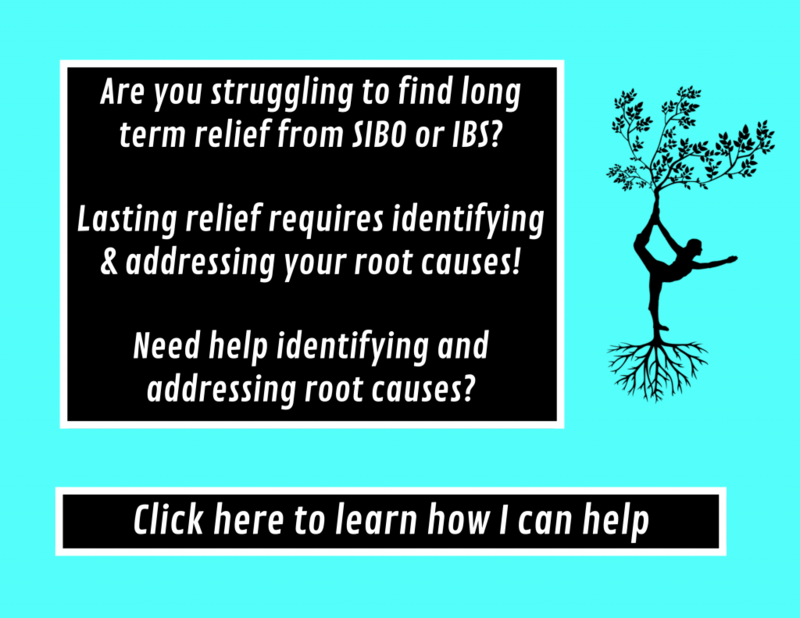 For long term healing of SIBO, you need to uncover your root cause factors and address them. The first is Migrating Motor Complex (MMC) deficiency and motility disturbances. MMCs are electrical signals that stimulate the smooth muscle in the small intestine to cleanse the tract of food debris, bacteria and waste between meals. You can think of the MMC as a little broom that keeps the small intestines nice and tidy between meals. Dr. Pimentel, a prominent SIBO researcher, reports that there is a 70% reduction in MMC function in SIBO patients. Low vagus nerve function, high blood sugar, high cortisol levels, hypothyroidism, food poisoning, brain injuries, gut inflammation and brain inflammation can all lead to brain-gut axis issues that suppress MMC activity. When food and bacteria are not efficiently being swept out of the small intestine into the large intestine between meals, the small intestine environment becomes ripe for bacteria to overgrow. The second breakdown that can lead to SIBO is malfunctions in digestive function. If you have low stomach acid, poor bile production, liver congestion or low pancreatic enzyme levels, you will create a SIBO friendly environment. PPI use is a big risk factor for developing SIBO because it lowers stomach acid, which lowers the release of pancreatic enzymes and bile in the small intestines. Pancreatic enzymes and bile not only help you digest, but they also keep bacteria in the small intestine in check so that it doesn’t overgrow. Last but not least, the third potential reason why SIBO can grow is due to intestinal adhesions or scarring from bowel surgeries, trauma, infection or inflammation. If you have a history of pelvic or abdominal trauma, adhesions need to be ruled out during treatment, because they can cause relapse. Diagnosing SIBO can be a bit tricky! The gold standard is to culture bacteria directly from the small intestine. But this requires an endoscopy making this testing method invasive. An additional drawback is that this methods usual only test the first part of the small intestine (the duodenum), which potentially misses overgrowths further down stream. Breath testing is what is typically used to diagnose SIBO. These tests involve drinking a sugary solution (glucose or lactulose) and then collecting your breath every 15 minutes for 2-3 hours. A lab will then measure your gas production (hydrogen/methane). These gases are an indirect measure of bacterial levels. If you have high levels of these gases being produced by bacteria, it is highly probable that you have an overgrowth of bacteria in your small intestine. Like every testing method, breath testing has its pros and cons. The pros to a breath test is it is non-invasive and rather easy to administer (you can do it in the comfort of your own home). The main con to the breath test is that its not 100% accurate. There is potential for false negatives and false positives. To reduce the chances of a false positive/negative, you should follow a strict prep diet before the test. It is also important to work with a SIBO knowledgeable practitioner who can review your labs and your symptoms to determine if you have SIBO or not. Other tests like stool test, organic acids testing and blood tests for nutrient deficiencies can provide supportive evidence for a SIBO diagnoses, but they shouldn’t be used alone to diagnose SIBO. There is no one way to treat SIBO. It takes a multifaceted approach treatment plan to clear the SIBO for good. Every treatment approach should be ROOT CAUSE FOCUSED. If you fail to address the root cause issues, the SIBO will return no matter how many times that you try to clear it. While SIBO isn’t solely a bacterial problem, you still have to address the overgrowth. Usually this involves a clearing phase with pharmaceutical or herbal antimicrobials. Certain probiotic strains have shown efficacy in clearing the SIBO too. If these clearing attempts are not successful, some SIBO sufferers may try an elemental diet for 2-3 weeks to starve the bacteria. After the bacteria is cleared, you are then tasked with addressing your root causes and rebalancing your gut bacteria following the antimicrobials. This phase repair and rebalance phase is the most important part of treatment and is often overlooked by SIBO sufferers and conventional practitioners. Unless you diligently address the root cause and repair imbalances in your microbiome, your SIBO will come back.